This is a rectangular Warning Gas Pipeline porcelain sign. This particular Warning Gas Pipeline sign is white with red and white text. 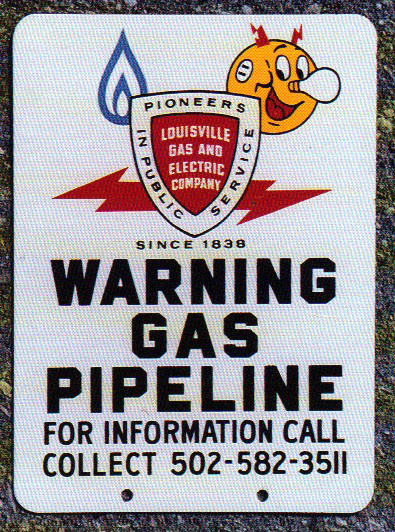 It reads, “Warning Gas Pipline, For Information Call Collect 502-582-3511, Louisville Gas and Electric Company, Pioneers in Public Service, Since 1838” and features a red shield with a yellow cartoon face, blue water drop, and red lightning bolt at the top of the sign.